BOOK YOUR FIRE PIT NOW! 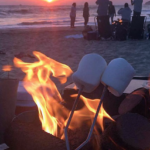 You can now book online a Fire Pit Packages to enjoy BBQ-ing, S’mores or just a nice warm Fire at Crystal Cove Beach. » FIRE PIT EXPERIENCE FAQ! Please note, party size is limited to 12 people or less due to limited space (roughly a 10’x10’ area) and park regulations. Open from Mid-June until Labor Day, 7 Days a Week! 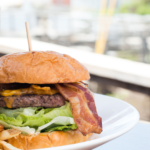 The Beachcomber Express is a summer food option serving your favorite grilled items and beach snacks throughout the summer. How do I rent a fire pit? Renting a fire pit is easy and can be done online by clicking here using your credit card to reserve a fire pit. You may also rent one directly at the Beachcomber’s express beach tent located at the Historic District of the Crystal Cove State Park. How old do I need to be to rent a fire pit? You must be 18 years of age. A valid ID is required. Where can I use the fire pit? Fire pits can be used on the beach within the Historic District of the Crystal Cove State Park. How do I pay for a fire pit rental? Fire pits can be rented by using a valid credit card. A valid ID is required to verify age. Is a deposit required to rent a fire pit? Yes, a deposit is required to rent fire pits. Where can I learn more about the Grill ‘N Glow fire pit and barbecue? Are other forms required to rent fire pits? Yes, you will need to read and sign a liability waiver. Do I need to bring wood or other fuel? No, the fire pit rental includes one propane tank that fuels the fire pit. No alternative fuel, wood, or combustable materials are permitted to be used with the fire pit beyond the fuel provided. How long can I rent a fire pit for? Rental times vary depending on the fire pit packages purchased 2 or 3 hours. Party size is limited to 12 people or less due to limited space (roughly a 10’x10’ area) and park regulations. Is using a fire pit safe for the environment? Yes, using propane to fuel the fire pit provides for cleaner air quality and reduced particles associated with those using wood as a fuel source. Can I order Food or S’mores for my fire pit? Yes, we have several options available for purchase to enhance your fire pit experience. All rentals require and adult signature with a signed rental agreement, and a monetary deposit. Beach Rentals are available on a “first come, first serve” basis. All sales are final. None of these items are available as rentals.